We're excited to share that our church has access to an extensive, new video library called RightNow Media! 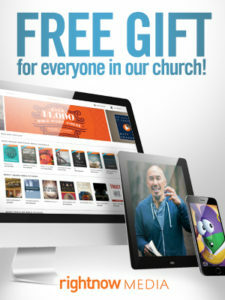 It’s like the "Netflix of Video Bible Studies" and has a HUGE library of faith-based videos that you can access whenever and wherever you want—on your phone, iPad, computer, or at home on your TV. Sign up below to receive an official invitation email to give you FREE access to RightNow Media. How to use RightNow Media! How do I access RightNow Media once registered? How do I use RightNow Media once logged in? Sign up to receive your email invitation by using the sign-up form above. Click the get started button in the email invitation and create your account. Once you choose a title you will see a “sessions” box, you can click and play any of the titles. Books to go along with the videos will say buy now. If you want to use this as a small group, contact emcdonald@lmumc.org and Ellen will order the books for you. Contact Ellen McDonald, Director of Discipleship, Ministries, and Mission at emcdonald@lmumc.org.